This week’s Monday Madness focuses on the big news: after nail-biter, down-to-the-wire drama, the Supreme Executive Committee has announced that Lent will proceed, since the Lent Madness Facebook page achieved its goal of 20,000 likes, just in time for Ash Thursday. As you know, the threat of a Lent shutdown had been made, throwing the ash and pancake industries into turmoil. 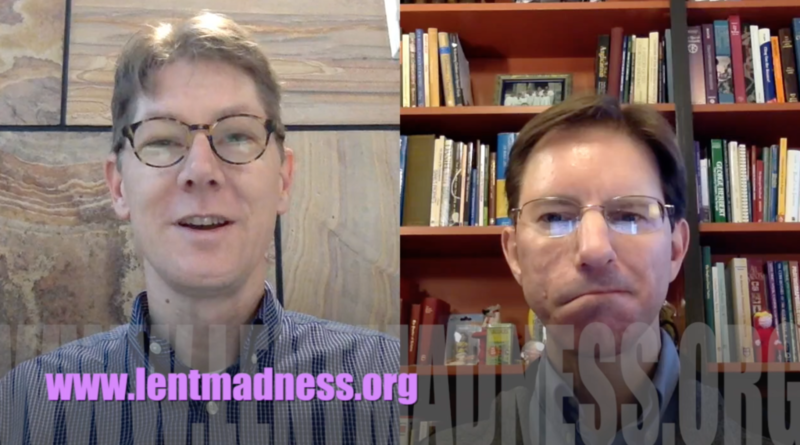 Tim and Scott discuss the averted shutdown, as well as previewing the opening contest in Lent Madness 2018. We finally find out if the voters will rob Peter to pay Paul or if they’ll rob Paul to pay Peter. Either way, someone’s getting robbed. Now is the time you should be finishing up your bracket predictions and generally talking up Lent Madness. While it’s too late to get bracket posters, you can print out your own brackets by visiting the bracket tab of the Lent Madness website. And it’s too late to send you printed scorecards, but they’re still available for your Kindle, Nook, or iBook gizmos. If you see the SEC out and about, you can hand them your e-reader and a Sharpie, and they might autograph your gizmo. Remember, the action all starts this Thursday at 8:00 Eastern time. The SEC suggests staying up all night on Lent Madness Eve and hitting refresh in your web browser, just in case some glitch results in an early start to the voting. This is here for social media sharing. 16 Comments to "Monday Madness — Game On Edition"
Has it already been caught and lost that Catherine Winkworth is in early alpha order before John Wesley? ? Thanks for this human touch and for the new challenge this year of a redrawn and quartered bracket! ajumbling it up with the NFL and AFL. And women on the field not part of the cheer squad! Fun! I am looking forward to this year’s Madness. A good way tolewarn aboutthese Saintly people. Thanks for doing this each year. My first association with this is very exciting, I have my faves and not so fave where Saints are concerned. I also have my not-so-faves among the saints offered, of course, but I believe it’s the year of the woman! So glad I have my bracket sheet and am now ready for Thursday am! Edith Cavell for the Golden Halo!!! And also, btw, viva John Sell Cotman (astonishing 19th century watercolourist) and Norwich… site of commemorative sculpture at Norwich Carhedral. JW for the win! The first bro-winners of the Golden Halo. Going on to perfection! Yeah! You changed the image and music! Love ❤️ both! Having to chose between Peter and Paul does not make me merry. What? You’re starting with a choice between Peter and Paul? Unfair! It’s a given that the Golden Halo this year will not go to a saint from the U.K.
I’d download that. Heck even a Foreard Movement Day by Day app that included an option to also participate in Lent Madness is something I would love to see in the App Store.
. . . Forward Movement . . . ugh auto-co-wreck . . . and no edit button . . .